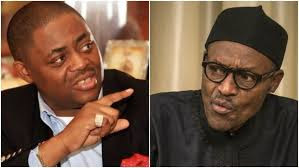 Former Minister of Aviation, Femi Fani-Kayode, has called President Muhammadu Buhari “an uncircumcised philistine”. In a new post on his personal website, Fani-Kayode uploaded Buhari’s image, along a lengthy write-up. The full text reads: “Who is this uncircumcised Philistine that has chosen to defy the armies of the Living God? You come against us with Fulani herdsmen, Boko Haram, Arewa Youths and your brutal army but we come against you in the name of the Lord of Hosts, the God of the Armies of Israel. “Thy servant slew the lion and the bear and so it shall be for this uncircumcised Philistine that has chosen to defy the armies of the Living God. “David had Prophet Samuel, Prophet Zadok and others. “We have Prophet TB Joshua, Bishop Oyedepo and others. Our God is mighty in battle and He is doing a new thing! How can we lose? “Once has it been written and twice has it been said that all power belongs to God and the heavens rule in the affairs of men. “The children of darkness can NEVER overcome the children of light. The sons of slaves can NEVER overwhelm the sons of the Lord. The counsel of the ungodly can NEVER overule the counsel of God. “No matter what comes our way, no matter how many trials and tribulations we pass through and no matter how much pain we suffer, in the end WE SHALL PREVAIL.